As of late, I have been neglecting one of my favorite ingredients, bacon. This is no longer acceptable. I posted on Facebook that I was going to make something with bacon, peanut butter and chocolate and asked for ideas, feeling that one good thought leads to another. I was right. My friends had wonderful suggestions for me that sparked an idea. How about a peanut butter, chocolate, bacon pie? Sounded good, but then I had to figure out the placement of each ingredient. My first stop was to Whole Foods to buy the bacon. They have several kinds from which to select and I chose their 365 brand uncured bacon. Next, I spoke with Gary, who now works at Whole Foods, but many years ago co-owned a wonderful restaurant that bought my desserts. We brainstormed about the crust and he told me about peanut butter sandwich cookies that the store sells, which he said are delicious. Done! Cooking the bacon was first on my to-do list. I do not love the splatter of cooking bacon on the stove and now bake my bacon in the oven instead. One 12-ounce package of bacon had 12 slices. I baked 6 of them plain for the inside of the pie and topped the other 6 with maple syrup and brown sugar for the top of the pie. Once the bacon cooked, I strained the bacon fat through cheesecloth and used that to bind my peanut butter sandwich cookie crust. I used over a pound of cookies for the crust, because I like a nice solid crust for these kinds of pies. Once the crust baked and cooled, I topped it with chocolate ganache. There are two ways to get ‘just the right size’ bacon strips…break them with your hands or cut them. I cut the bacon with scissors. For the inside of the pie cut the bacon into smaller pieces. For the top, cut the maple bacon into longer strips. I put the smaller strips of bacon over the ganache and topped that with chopped lightly salted cocktail peanuts. Making the peanut butter filling could not have been easier and the creaminess is luscious. Drizzling chocolate ganache and then placing strips of maple bacon on top of the pie make for a very eye appealing dessert. Looking attractive is certainly important, but taste is top priority. Peanut Butter Piggy Pie hits the mark. Each bite is a blend of all of the ingredients. Depending on where the ingredients hit your taste buds, one flavor may stand out in one bite and another flavor in the next. You do not have to be as bacon obsessed as I to love this pie, but there is a good chance that you may become a bacon loving ‘oinker’ once you give it a try. Cook bacon first. Preheat oven to 350°. Line two baking sheets with heavy duty aluminum foil. Place 4-6 slices bacon on each sheet. For the Topping slices, rub maple syrup on top of each slice and sprinkle with light brown sugar. Bake in 350° until dark in color but not burnt, about 25-30 minutes. Be sure to rotate pans top to bottom and front to back halfway through. Watch carefully towards the end. Remove from oven and transfer to paper towel lined baking sheet to drain. Do not allow maple bacon to sit long or paper towels will stick to them. Set aside. Leave oven on at 350°. Strain bacon fat from both baking pans through a cheesecloth lined strainer. Place cookies and bacon fat into food processor. Process until all cookies are finely chopped and mixture holds together. Transfer to 9” pie plate. Bake in 350° oven for 10-12 minutes. The crust sides will look drier than the middle. Remove from oven and cool completely. Place chocolate into small bowl. Bring cream to a simmer and pour over chocolate. Allow mixture to sit for 5 minutes and then stir gently until fully blended. Remove ¾ cup ganache and pour over cooled pie crust. Cut bacon slices into small pieces using either scissors or a knife. Evenly place over chocolate ganache. Top bacon with chopped peanuts. Combine cream cheese, peanut butter, confectioners sugar and milk in large mixing bowl. Beat until creamy, about 3 minutes, scraping bowl down as needed. In a separate mixing bowl, beat whipping cream until stiff peaks form. Fold whipping cream into peanut butter mixture. Spread evenly over chopped nuts. Transfer remaining chocolate ganache to a small plastic freezer bag. Cut small opening at bottom and drizzle ganache over filling. Cut maple bacon into ⅓” – ½” strips using either scissors or a knife. Place partially into pie, leaving part of each piece exposed. Allow Peanut Butter Piggy Pie to sit outside refrigerator for 30 minutes before serving. If the thought of using bacon fat in the crust is outside your comfort zone, substitute melted butter. The number of bacon slices is a personal preference. Want more bacon inside and outside? Use 6 slices for each. Want less? Use 4. Additional time is needed for cooling. This is fascinating! I would try it, but might have to eat the entire pie myself! My family is not so adventurous! I don’t think I would care for an apple/bacon pie but there is something magical about peanut butter and bacon! We’re all about piggy’s at our house. This would be a decadent “conversation” starter! That is would be, KC!! Betsy I recently read bacon is really good for your brain…and we all know chocolate is the newest health food and Peanut butter? An old health food stand by! Wow This is so great! All my favorite health foods:) And this pie looks so tasty I couldn’t possibly pass it up. OINKERS live at my house! Seriously, everything tastes better with bacon! I’m drooling over the sweet and salty combination. There is something so magical about that sweet and salty thing and EVERYTHING is better with bacon! I haven’t yet made a sweet with bacon and sounds like a fantastic idea! Your pie looks terrific! Thanks so much, Katerina. Peanut Butter Piggy Pie is a great way to dive right into a sweet with bacon. That’s the way I think, too, Erlene! oh my… i do love peanut butter anything! this looks so rich i could only eat a bite or two but i can’t wait to try it! You had me at bacon. I buy my bacon at Whole Foods too. I get the Black Forest bacon in the meat counter. It’s amazing. I love the Black Forest bacon at Whole Foods. I am so happy with the nitrate free options, Nicky! 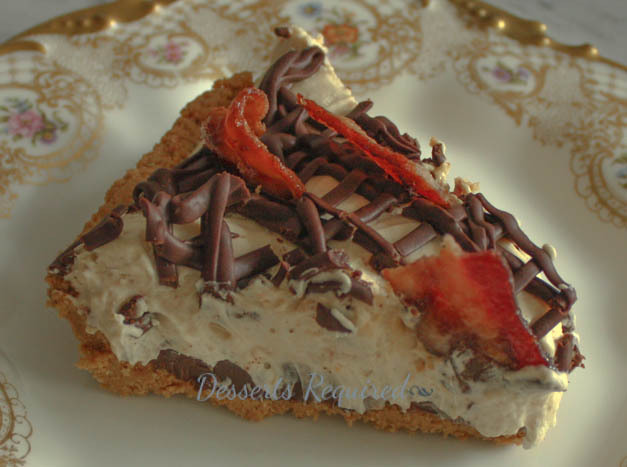 Wow, peanut butter, chocolat and bacon together in a pie? Sounds wonderful! Thanks, Joy. It really is wonderful!